Scratch This – These Two Eyes! Listen all of y’all this is sabotage! Listen all of y’all this is sabotage! Apparently this popular Beastie Boys song was on repeat all day last Thursday at The Scratch, craft beer bar extraordinaire, in preparation for the Yeastie Boys event held that evening. Spell Check is on mind you. 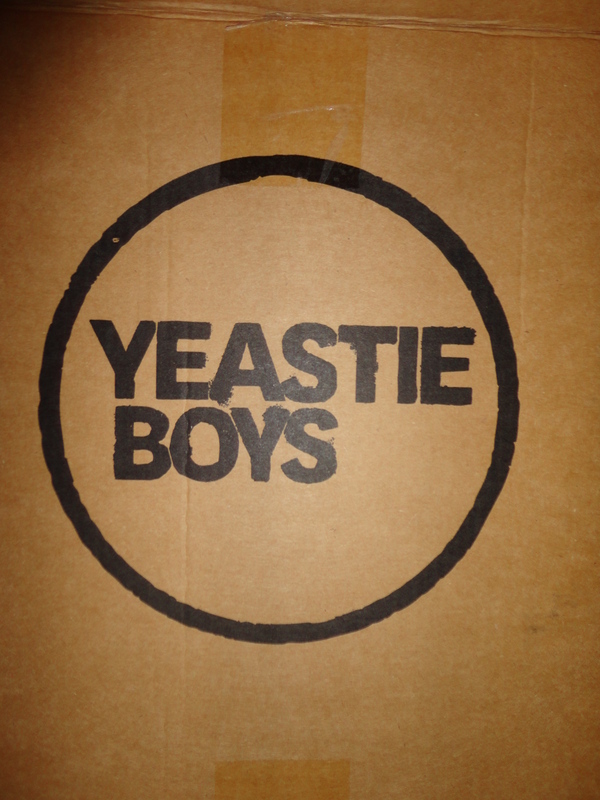 That reads Yeastie Boys, the boutique New Zealand brewery specializing in taste bud exploding, nostril flaring nip. Brew master Stu made a pit stop in good ole Brissy, somewhere he hasn’t been since the late 80’s, to share with us beer loving folk a tale or two to compliment his flavorful science experiments. Now picture yourself in a basement. 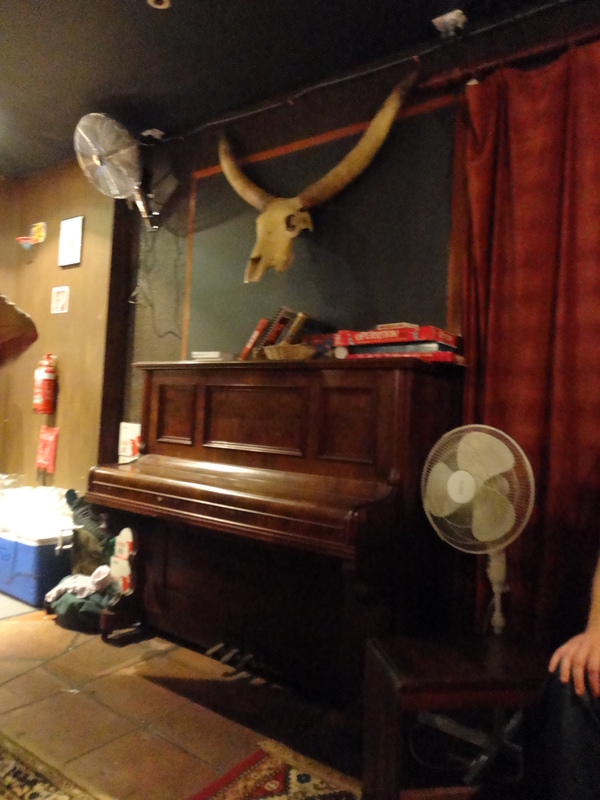 Start with four walls, hanging from are oddities like a horned animal skull set above an unpolished piano and an oversized old-school brass record player speaker cut in half. Now, in the far corner add in your grandmothers chez lounge, only it’s been in the garage unused for a few years. Then there is the green couch from your Aunt Myrtle’s tea room, complete with a plush velvet finish. A makeshift table is made from a solo snare drum; don’t tap too loud now. Toward the back of the room a miniature Asian table sits about two feet from the floor, with tiny chairs to go around it, to give your back an awesome hunch. This is no basement. It sure feels like one to me though. You know, like where you hung out as a teenager sneaking beers and talking gossip with your friends. (Mine was actually a shed out back of a friend’s house, instead of underground but you get the point). The place gives you a sense of…I feel good, I’m with my friends, this furniture has seen its day, good times! This is the best new bar to hit Brisbane, and of all unsuspecting suburbs, Milton. Upon walking in you’re greeted by what can only seem like old time buds, three dear friends who opened the place just a few months back, with a sampler of what’s on tap today. See that’s how it works here, there’s no fancy nitrogen tap system installed by big name distributers. The boys themselves wheel in the kegs of local microbrews from the alley out back, hook them up to one of the four taps, and when they go, they’re gone. Scratch one off the list and bring in another! I mean, that’s what the chalk board is for, right? Clearly this is the new local for obvious reasons. 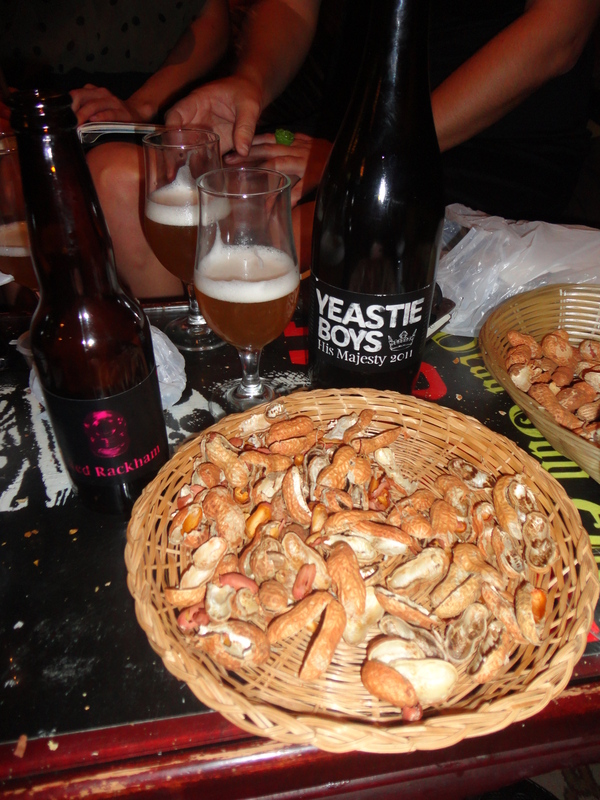 The boys were selling tickets to the Yeastie Boys event weeks in advance, and for $35 we couldn’t refuse their beer loving enticement. The ticket included 5 healthy samples of Yeastie Boys offerings, including a surprise beer on the newly installed hand pump, in addition to a full crisp beer on arrival. Add to the fact that the boys were around making sure our complimentary shelled peanuts, a Scratch staple, we’re fully filled in between rounds of local cheeses being shared throughout the bar. They’re smart these boys, they’re cute too, but they’re damn smart. The beer on arrival was the American style, super hoppy, Digital IPA from the tap, and so I was shocked when the first beer of the tasting was the Pot Kettle Black from a bottle. This delicious black IPA, or what others would describe as a hoppy porter, is Yeastie Boys’ biggest seller, bringing in 50% of sales. Mmmm, it’s fantastic, but why so dark so fast? What I had no idea in advance was that Stu himself had received hate mail in response to some of his brews being so alarmingly potent, and therefore, we were starting with the easy stuff. Yikes! I’m glad another advantage of this place is that you can bring in outside food, and with the number of takeaway joints lining Park Road, arriving early to snag a seat and munch down on some Thai was a good choice. A quick rinse of our glasses and we moved on to the Red Rackham, named after the first movie Stu took his son to go see, which was a fruity Belgian style. You’ll notice a theme of pop culture reference to many of the brew’s names. This was a limited release, and more or less only exists because the wrong yeast was added to an already established beer they were trying to brew, however in the end they got this. Muah, it’s good. 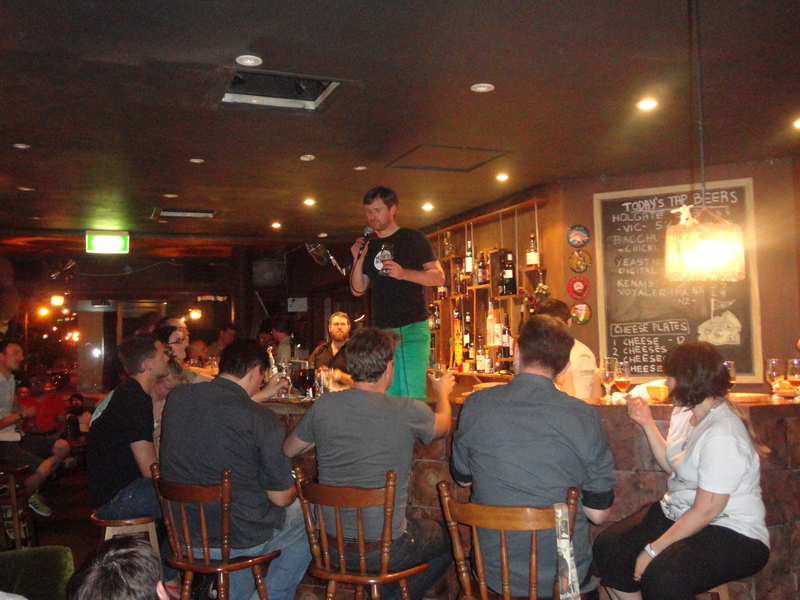 Stu tells us New Zealander brewers are more experimental then Australians. As he said this statement, I looked around the crowded bar as I was curious if anyone had taken offense. In between nibbles of goat cheese, oh my gosh, I question people who don’t know the value in a delicious goat cheese; we transitioned to His Majesty 2011. Served out of a magnum bottle, only one batch of both His and Her Majesty are brewed a year, and His is a more traditional, English IPA, more mild then the American style IPAs that tend to lean heavily on the hops. It’s about time to get serious. And I mean serious. Up until this very moment, even the boys at The Scratch didn’t know what the mysterious beer in the hand pump was. It was about to be revealed, and I was a bit apprehensive. Whew, thank god the fresh Brie made its way around because holy tomato! All of 50 patrons, which is 10 people less than capacity mind you, however fit into the bar quite comfortably, lined up at the tap to get their taste of Rex Attitude. Even at first pour the smell, whew, the smell, made its way around the bar. To quote dear friend Jacqui, “if a hospital tasted like beer, it would taste like this”. Aged for 12 months in a chardonnay barrel, the beer itself was only 7% alcohol however is made from 100% pure peated malts. It’s definitely an acquired taste. Interestingly enough though, the final beer of the night was the Imperial Rex; still had the potent, medicinal touch however was more drinkable, at least to me. It was obvious that the two were so intense, yet different enough from each other, that typically one will have a clear preference of one over the other. I think my nostrils still have that stench lingering on them. So that was it, another great evening at The Scratch and a successful event that has inspired more like it to come. For those that could actually swallow down the Rex Attitude they were encouraged to drink the keg dry, awesome for them. I just can’t wait to see what gets put on the hand pump next. It took longer then I would have liked, but am damn happy to have found a place to call my local. Sounds excellent! I wish I had a place like that. Oh man!!! I want to drink delicious beers at The Scratch!!! Cute description! Sounds fun! !